In this column I will dive into times, throughout superhero history, that comics got political. There seems to be a constant debate if political discussion has a place in the medium. I hope to show that politics and superhero comics go together. This time The Fantastic Four fight The Hate Monger. As you can see from the cover there is very little room for interpretation of this specific villain. 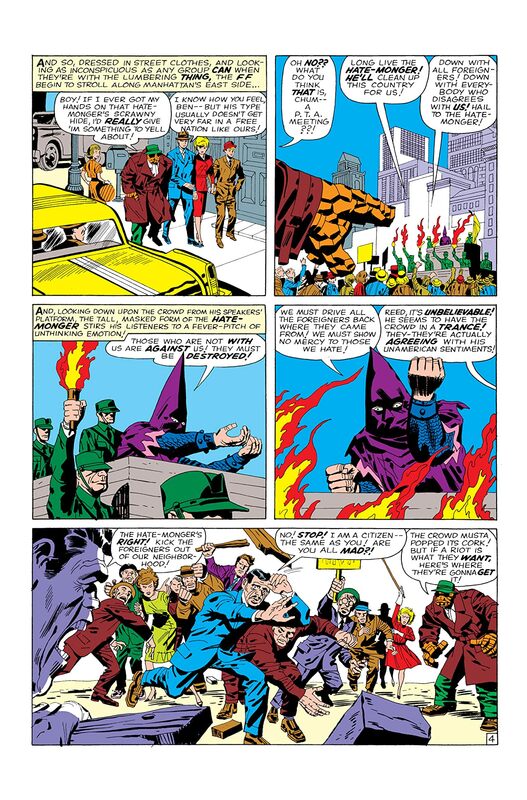 He is dressed in slightly altered KKK attire, and his name is literally “The Hate Monger.” Stan Lee and Jack Kirby were not really going for subtlety here. However, the interesting thing is the character is not played the way you would be expecting. The Hate Monger instead uses his influence and power to poison the minds of the public, in order to insight fear and distrust. While this is later found out to be the work of a mind altering H-Ray, the way the American public were acting is not much different than what was happening in the early 1960s. This comic was published in December in 1963. This date is significant on a number of levels. First off, Martin Luther King Jr. was alive and active. The “March on Washington” happened only four months prior. Racial tensions were high, and the civil rights movement was in full force. Segregation was shot down on a school board level, by the supreme court, but elected Alabama Governor (and later presidential candidate) delivered a white supremacist speech during his inauguration. “In the name of the greatest people that have ever trod this earth, I draw the line in the dust and toss the gauntlet before the feet of tyranny, and I say segregation now, segregation tomorrow, segregation forever.” – George Wallace. Speeches were written by Asa Carter founder of a KKK chapter. Sounds no different than our title villain in this issue. The Immigration Act was not put into place until 1965, which allowed for a broader immigration base past western and northern Europe. Even when the act was signed there was plenty of public outcry and xenophobia was rampant. So we have a character with clear allusions to the KKK, yet he is acting like a politician. Using this strong imagery removes all doubt of the creator’s intention. The are using the Hate Monger to comment on the behavior of politicians and the American public. Especially at a time you had politicians with direct connections to the KKK. Adding more to this imagery is the reveal of who The Hate Monger really is, Adolf Hitler. The only way any reader could take this message is that being anti-immigration is akin to thinking like Adolf Hitler. While these politicians don’t have H-Rays, they do tend to use scapegoating, and gas-lighting to fool the vulnerable public. This anti-immigration, anti-foreigner, xenophobic message, from The Hate Monger, was no different than what was being said by many people at the time. Stan and Jack took the hate they saw in the world around them and gave it a direct face, and a villain, for the Fantastic Four to conquer.